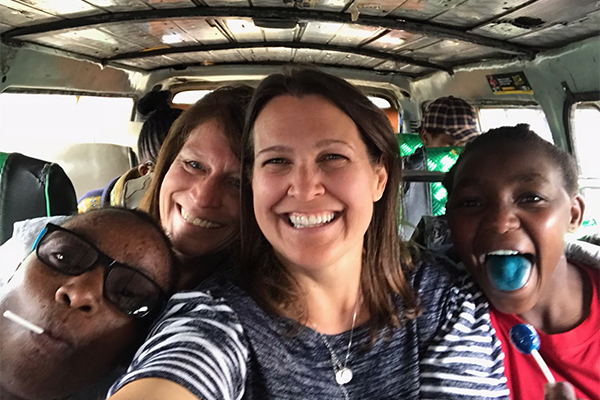 We arrive at the Joy Village and see that the children we’ve been praying for and learning about for so many years are thriving under the loving care of their mammas. The younger children are still busy at their respective local schools, so I walk to the market with two of the older girls who are home on break from their high school studies. The girls easily navigate the muddy road downhill to where the lane splits so that we can pick up the perfect chicken for Saturday supper. I observe with appreciation and respect as the oldest negotiates the selection and price for a LIVE chicken, which she happily allows me to carry back up the hill. In between squawks and giggles, they teach me a few basic words in Swahili and gently move me out of the way of the motorbikes that sneak up from behind us. The girls talk freely about the successes and challenges around their studies and dormitory life, and with a little prompting they also share their dreams about what the future might hold. It strikes me that I have the very same conversations with my own children who are almost their exact same ages. When they ask why I don’t come to Kenya more often, they seem pleased to know that I, too, have responsibilities at home and plans that require my hard work and thoughtfulness. We return home and I am glad to part with the chicken but not the girls. We continue our conversations throughout the afternoon and my heart is warmed by their honesty and kindness.